Have you gone through the phase of data theft or data stealing due to the excess usage of USB mass storage devices without your consent or have your confidential data has been used by unauthorized users over Windows network? Don’t worry and give a break to all these mischief by adopting Data Doctor’s USB Activity Monitoring Software. USB Data Theft protection tool capture connection and removal activities of USB mass storage devices in real time monitoring. 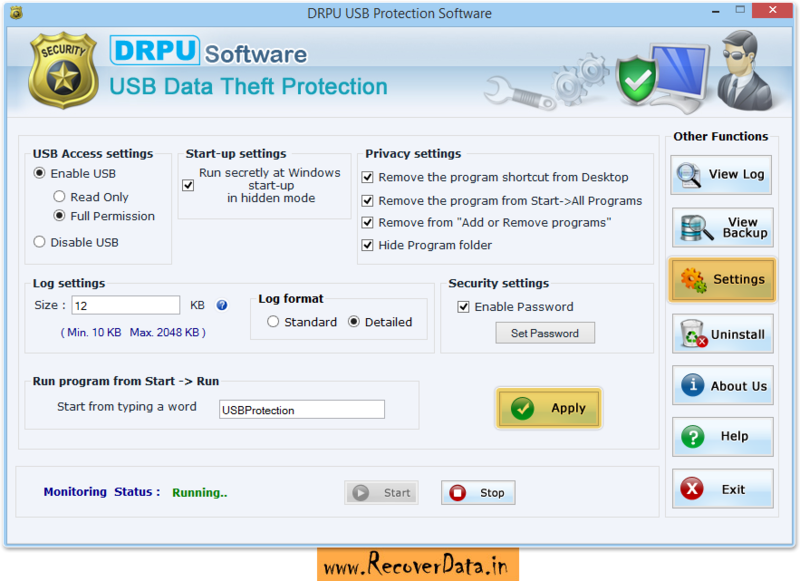 Using this anti-data theft utility, administrator can easily assign the USB device’s access and permission settings. Software provides details of USB storage devices including system details, user details, USB details and network details etc. When you run the software, above screen will be displayed. Here, you can set USB Access settings, start-up settings, Privacy Settings, Log Settings, Log Format and Security Settings. Provides real time monitoring of the USB mass storage device activities on your PC. Monitors connection and removal of USB device even when the network cable is unplugged or network connection is broken. Prepares real time log and offline log containing the detailed information of USB devices. Administrator can easily enable or disable the USB mass storage device accessing on client’s terminal. Software provides facility to view real time devices log status in HTML(.html) and TEXT(.txt) file formats. Access and permission settings are recorded in Activity log with date and time.